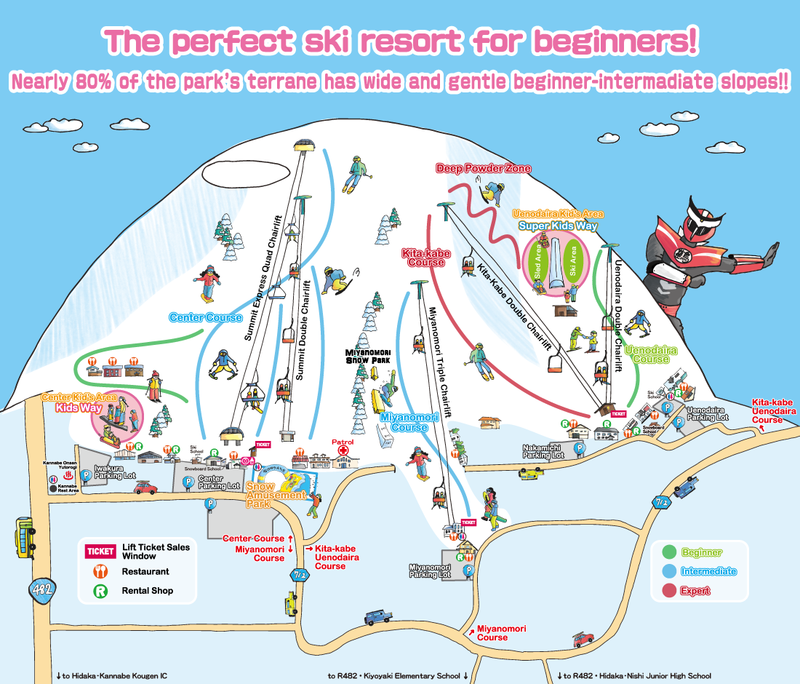 New this year is one of Japan’s longest “Super Kids way”, an easy to use standing type lift that will bring you to the top of Uenodaira Course. 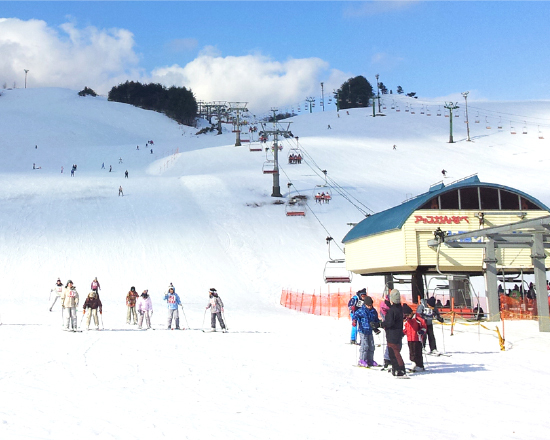 This course is highley recommended for people making their first snow debut. With good flat burn speed demons can let loose and powder lovers will drool as they make first tracks on the fresh morning snow. 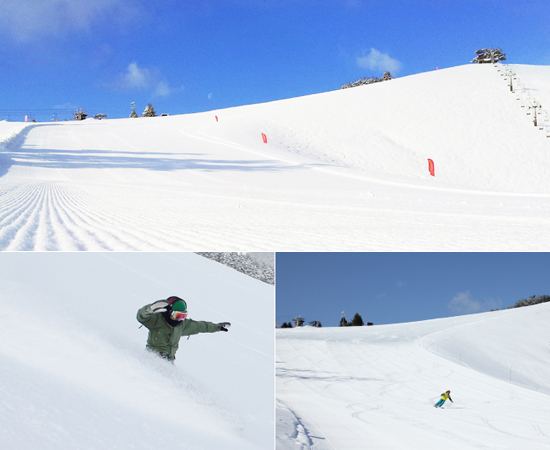 This is the place to fall in love with the winter slope all over again. Kita-Kabe Course is an advanced run, will the slope take you or you take it? 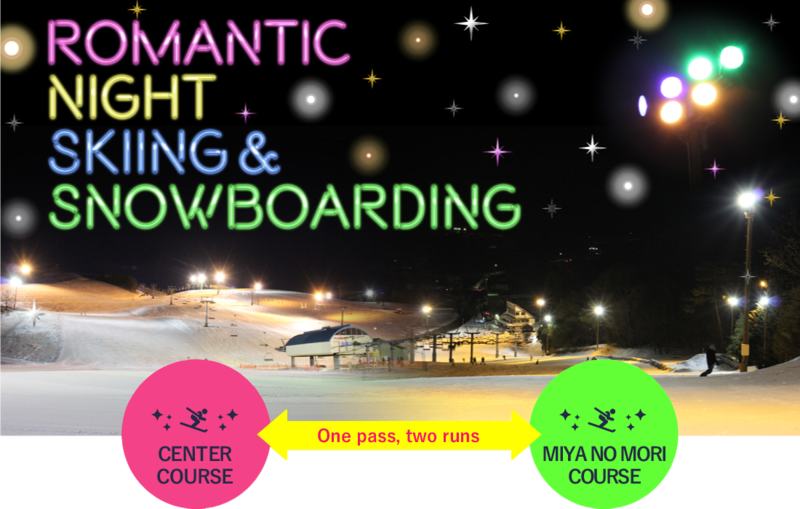 Miya no Mori is surrounded by forest and has a couple objects placed along the 650m course for your free style enjoyment. 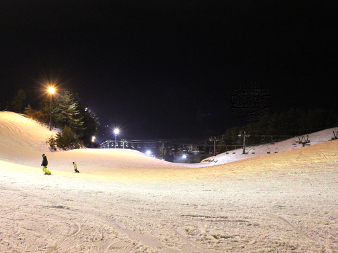 This is also a popular night skiing course. (Open every night for night skiing! 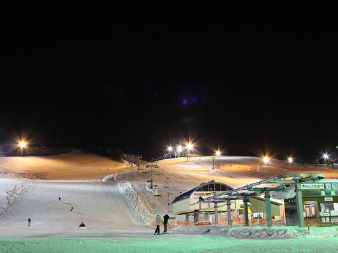 *Center Course is open Fridays, Saturdays and national holidays for night skiing)t? 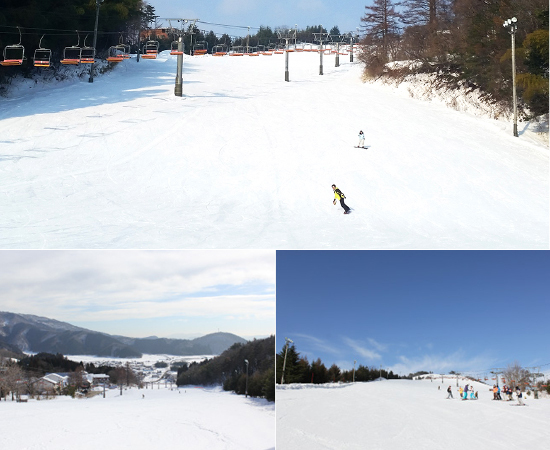 Kid can enjoy sledding, skiing and snowboarding on Uenodaira Kid’s Area and Center Kid’s area. 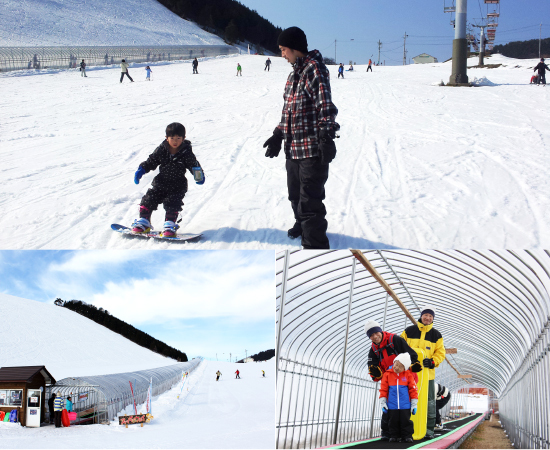 Uenodaira Kid’s Area features a 150m moving walkway that is used as a standing lift making it easy for even the littlest skiers and snowboarders to use. Kid’s can also enjoy playing in the snow in our spacious snow play area without having to worry about snowboarders or skiiers. 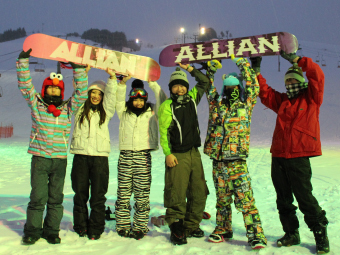 We recommend these kid’s area for first time skiers and snowboarders as well. New for the 2018-2019 season is the Kids Snow Amusement Park! Located at the foot of Center Course, this kid-friendly and family-friendly snow park includes a “Fluffy” Slide, Snow Merry-Go-Round, Snow Rafting, Snow Go-Karts, and Hot Air Balloon Rides!!! Come for a great time with friends and family, adults and children alike! 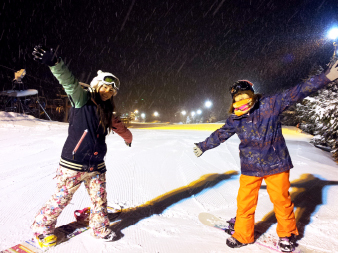 Enjoy a new mood with night skiing, different from day. Compared to the looser snow conditions during the day, the snow becomes more packed at night creating good conditions for night skiing. 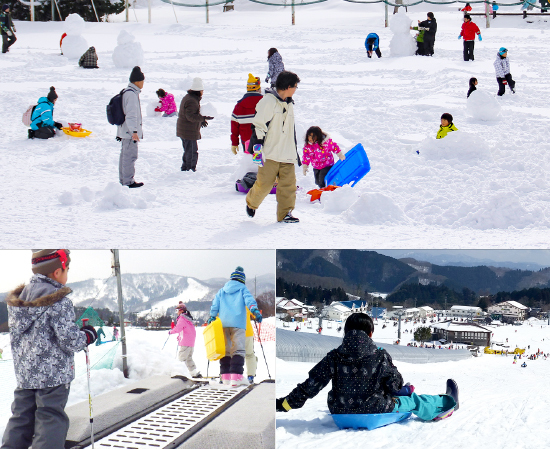 **Regular lift tickets can also be used for the Kidsway (Centre Kid’s Area), Super Kidsway (Uenodaira Kid’s Area) lifts, “Fluffy” Slide and Snow Merry-Go-Round (Snow Amusement Park). 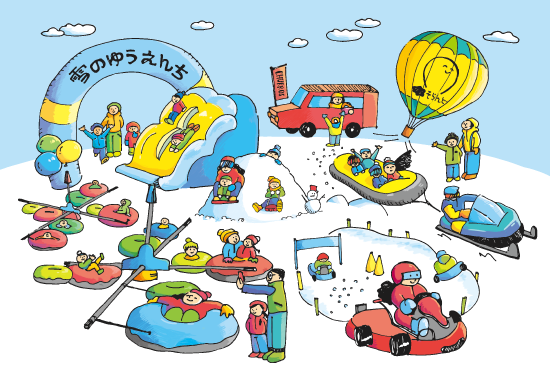 **Kids Area tickets can be used for the Kidsway (Centre Kid’s Area), Super Kidsway (Uenodaira Kid’s Area) lifts, “Fluffy” Slide and Snow Merry-Go-Round (Snow Amusement Park). INFORMATION – People must present a lift ticket, Kidsway pass, Super Kidsway pass or the like in order to ride any lift or use the Kidsway and Super Kidsway lift. – It is stictly prohibited and illegal for the resale, lending of and borrowing of any lift ticket (aside from single use tickets) according to the special cableway business article. – Violators will have their lift ticket immediately confiscated and will be legally dealt with accordingly. *There are serveral rental shops at the base. Please check directly with the rental shops for details. Copyright © Up Kannabe. All Rights Reserved.